For the fourth year in a row, BOWA has been honored with at least one Best of Houzz award — this year earning two! 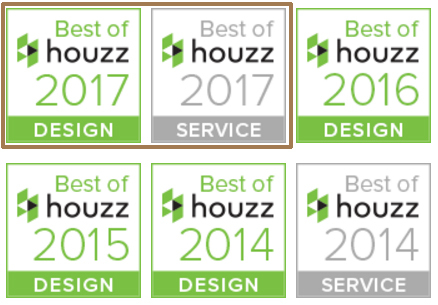 M cLean, Va. – BOWA (bowa.com), an award-winning residential design build firm specializing in luxury additions and renovations, was chosen as both the Best of Houzz Design and Best of Houzz Service by the more than 40 million monthly unique users that comprise the Houzz community. BOWA was selected from more than one million active home building, remodeling and design industry professionals. The Best Of Houzz is awarded annually in three categories: Design, Customer Service and Photography. Design award winners’ work was the most popular among the more than 40 million monthly users on Houzz. Customer Service honors are based on several factors, including the number and quality of client reviews a professional received in 2016. Architecture and interior design photographers whose images were most popular are recognized with the Photography award. A “Best Of Houzz 2017” badge appears on winners’ profiles, as a sign of their commitment to excellence. These badges help homeowners identify popular and top-rated home professionals in every metro area on Houzz. With a focus on delivering remarkable client experiences, BOWA specializes in luxury renovations ranging from master suites and kitchens to whole-house and whole-condo remodels. For over 29 years, BOWA’s design build experts have been guiding clients through every step of the remodeling experience from the first thoughts of the project, throughout architecture and construction, and continuing through a lifetime of ownership. And, consistently, 95% of clients rate BOWA a 9 or a 10 when asked if they would recommend the company. BOWA’s commitment to customer service and industry-leading budget guarantee, schedule guarantee and warranty are among their reasons. With offices in McLean and Middleburg, Virginia, BOWA has won over 200 awards for excellence and serves clients in Suburban Maryland, the District of Columbia, Northern Virginia and Virginia Horse Country. For more information, visit bowa.com or call 703-734-9050.